DOMESTIC GODDESSES: Straight forward fish cakes! But so yummy. Straight forward fish cakes! But so yummy. Fish cakes do not inspire much enthusiasm in me, but the request comes up over and over again with my clients. Usually I just skirt the issue and try to divert them with other suggestions, but for the client I trained this weekend, the request was very specific as his kids love them. 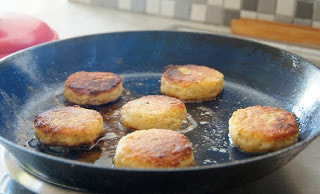 I needed to getting my ducks in a row around this recipe, as the only fish cake recipe of my own is a thai flavored sesame crusted fish cake, which was not going to be appropriate for these kids. Finally on Friday morning I thumbed through some of my recipe books and struck upon one which seemed sufficiently straight forward (Sonia Cabano's easy, simple & delicious - such a great cook book!). I tweeked the recipe here and there to suit my clients needs and my style of cooking. 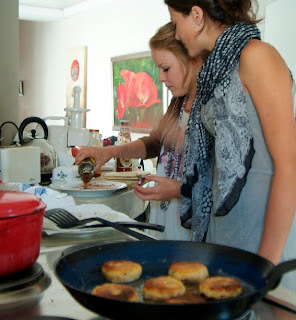 The end result was coming off the stove just as my two teen-aged nieces and a friend of theirs arrived for lunch. I ended up only getting one fish cake for myself while the rest were devoured to the mumble of appreciative noises from the girls before I could even get a decent picture taken. Suffice it to say they were a hit - with my nieces and my client and his family. While your potatoes are cooking, heat the oil and butter in a medium sized pot on medium high heat. Gently fry the onion, garlic and ginger until soft. Add the fish, breaking it up with a wooden spoon as it cooks and combines with the onion mixture. Once the fish has cooked, remove it from the heat and add the salt, pepper, lemon juice, zest and herbs. Once the potatoes are soft, drain them and mash until smooth. Add the potato to the fish mixture and stir until it forms a soft paste like consistency. Allow this to cool enough for you to handle it without burning your hands. Form balls about the size of golf balls with the mixture then flatten them into patties about 1.5cm thick. Arrange them on a small tray and refrigerate for at least 30 minutes, but at best a few hours. When ready to cook, heat some oil in a large frying pan on medium high heat. Dip the fish cakes into the egg, then roll them in the bread crumbs and fry them until golden brown and crispy. Serve them hot or cold with your favourite dipping sauce and a selection of veggies or a salad. PS - if you haven't already voted for me in the Eat In top local food blog awards - please do so by clicking on the icon below, then click on the pink voting button at the top of the page and following the prompts. If you really really like my blog, then share it with your friends on facebook or twitter by clicking the share buttons on the left side of this page. Are you referring to a whole fish crusted in a salt and stiff egg white mixture, which you later crack off? would love to make these but any wheat-free alternatives to the bread crumbs? suggestions please. love. R.
Kellogg's has a great 'crumb' mix made from corn flakes, Colleen says jungle oats works for her. I have seen a recipe which used crushed plain salted potato chips before which was fun. But my best would be to roll them in sesame seeds as the flavor is so yummy. We´ve tried them here in Argentina!!! Loved your recepie! The kids really liked them too! Thanks Thekla, had fun preparing them!!! So good to hear! Sometimes keeping it simple is the best way. What a gorgeous evening we had! My duck and I - a valentines story. Pear and summer berry clafoutis! Warning - this pasta could lead to over eating! Elizabeth David - Food writer and icon!